I’ve been wanting to share this sweet birth announcement for quite some time. I’ve known Kathryn, the client and expecting mother, for several years and was so honored when she contacted me regarding this very special project. Kathryn is the creator of Snippet & Ink, one of my most favorite wedding blogs. She has excellent taste, a great design eye, and a true appreciation of fine paper, letterpress printing, and vintage style design… I knew instantly that our collaboration would be a dream. 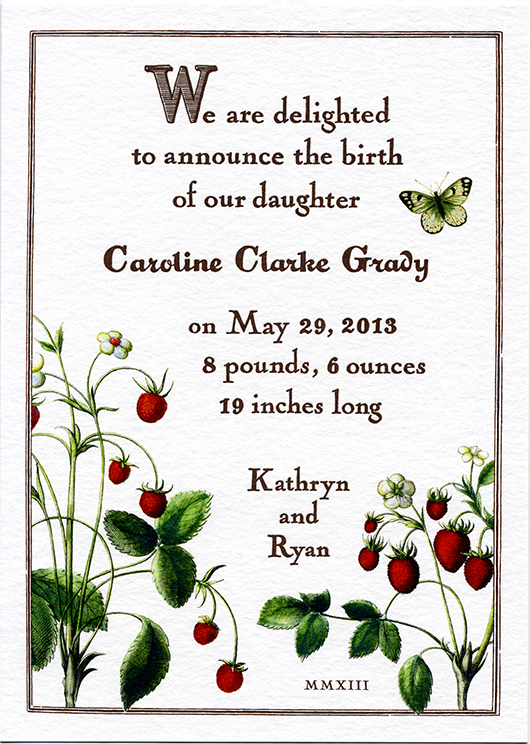 With her baby girl arriving in late Spring, early Summer, Kathryn wanted strawberries to be part of the design. She also wanted my hand-lettering style to be reminiscent of vintage children’s books. 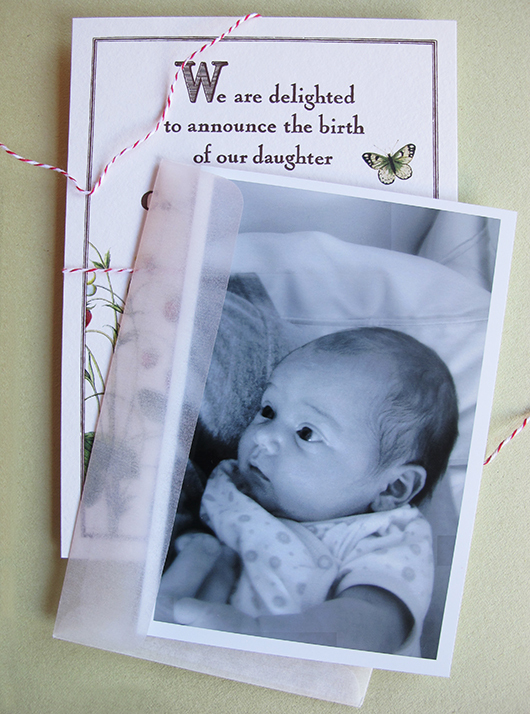 With such a sweet color palette we thought it would be great to tie the announcements, along with a photograph, into little bundles with red and white twine. And what lovely bundles they were! 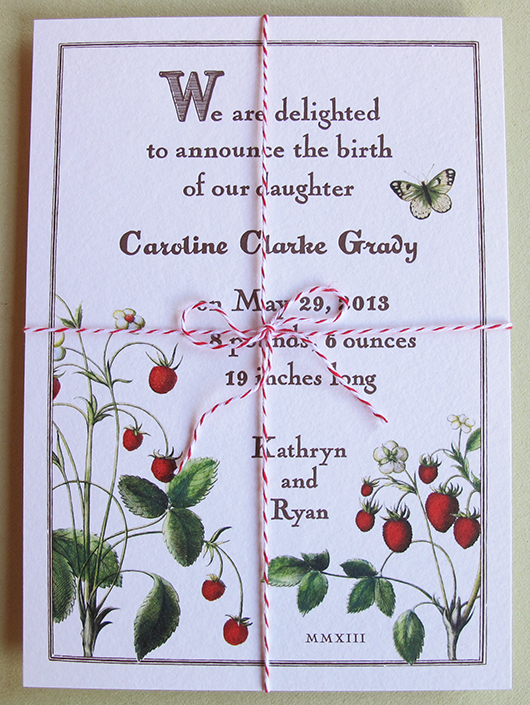 Kathryn put the gorgeous little photos of Caroline in protective glassine envelopes. I letterpress printed the return address, along with a sweet butterfly on the front of the envelopes. 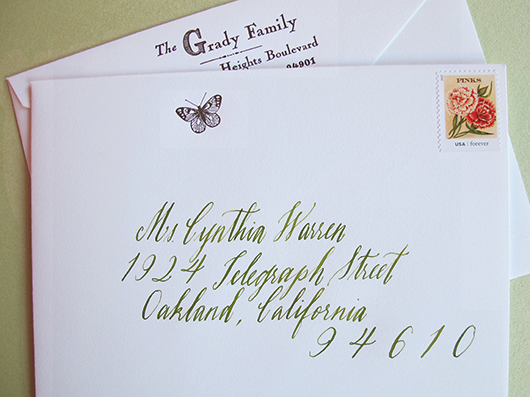 The envelopes were addressed in the perfect grass green ink by the fabulous calligrapher and artist, Maybelle Imasa-Stukuls. Maybelle’s charming style added such elegance and whimsy. 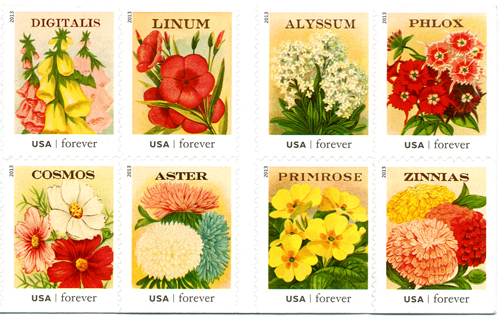 I found these beautiful seed packet stamps for the mailing, they couldn’t have been more perfect to complete the package. I can’t believe that little Caroline is already 4 months old, where does the time go? Thank you Kathryn for this wonderful project! Congratulations and much love. These are absolutely beautiful. Every detail is perfect.